If you own an older model house, upgrading outdated wiring will not only make it safer for you and your family, but it also might make your appliances work more efficiently. Many modern appliances require structured wiring, or heavy-duty data cables, and you can run this type of system when you replace your hazardous aluminum or ungrounded circuit wires. Running new wiring is messy enough even without removing the drywall. You can choose to rewire your home without taking down the existing wall covering. 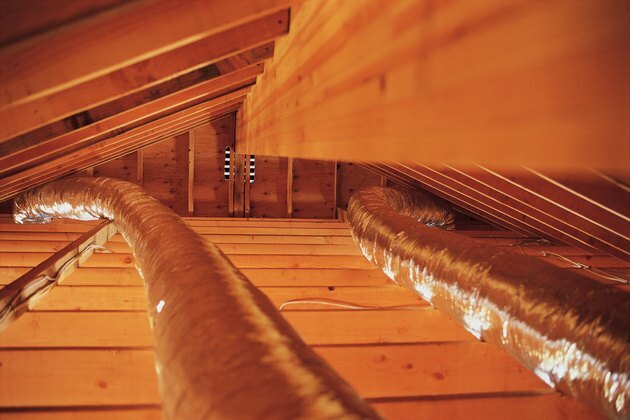 If you run wires through the attic, you won't have to uncover the walls. Before you start pulling wires, you need a detailed plan of both the circuitry you plan to replace and the new circuitry you are installing. Calculate the proper amount of wire and the most expedient routes for the circuits. If you don't want to remove drywall, then you'll be running most of the wires through the attic or the crawl space. Prepare for that by moving insulation away from the walls through which you need to pass the wires and marking the existing wires you need to remove. You can't always simply pull an old cable you no longer need out of the wall. These often are stapled to the framing. As an alternative, after turning off the breaker that controls a circuit and disconnecting the wires from the breaker, cut the cable, remove the exposed part and leave the buried part in the wall. If you happen across a cable that you can pull and you simply want to replace it with new cable, you can tape the new cable to the old, and when you pull out the old cable, the new one will automatically feed into the spot to take its place. Before you begin running wire for a circuit, precut an opening in the drywall for the box for each of the electrical devices on the circuit. Then, drill a 3/4-inch hole in the top or bottom plate of the wall directly over or under each one of the openings. It helps to have another person to catch the wire as you feed it vertically from the attic or crawl space. It might be easier to catch if you attach it to a length of rigid wire, such as a straightened out clothes hanger. The fact that you aren't able to staple cables to the studs behind the covered walls makes it especially important to secure the cables to rafters or joists with wire staples. Each wire must also be properly anchored to the electrical box for the device it powers with an appropriate clamp. You might find it expedient to split a circuit to provide power to more than one room. You can do this by connecting the wires in a covered junction box securely attached to a joist or rafter. The box must remain accessible so you can make repairs in the future, if necessary.